There are many tiramisu recipes out there but my favorite is my Italian friend Lynne’s. Her recipe originates from a friend of hers in Rome. It is luscious with just the right balance of espresso flavoring in the cream filling without being too sweet. It is a very simple recipe and can be made ahead. I was surprised to learn that it freezes well. Lynne generously shared one of her delicious desserts with us and I only take credit for adding the patriotic berries on top. A tribute to the great melting pot of cultures that make up this great country! In a bowl beat the egg yolks and sugar with an electric mixer until sugar is dissolved and mixture is creamy. Add the mascarpone and mix well. In another bowl, whip the cream until soft peaks form then fold into the mascarpone mixture. In a pie plate, pour the coffee and liqueur together. Dip the ladyfingers in the coffee, letting the excess drip off. In an 8 X 8 inch glass dish, create a layer of the ladyfingers, cutting some to size, to fill in. Layer half of the cream mixture and dust with some cocoa powder. Place a second layer of ladyfingers over this, going in the opposite direction. Spread another layer of cream and dust with cocoa powder. Chill in the refrigerator, at least 8 hours or overnight. The tiramisu can be made up to 2 days in advance allowing for the flavors to really blend together. Can be frozen up to 3 months. If freezing, take it out to thaw a few hours prior to serving. In Italy, it is often eaten partially frozen. The tiramisu could be made in a trifle dish, springform pan or in individual serving dishes as well. Just before serving shave some chocolate on top, if using. Or if desired, arrange blueberries and raspberries on top in a flag pattern for a patriotic celebratory touch. If so, make the tiramisu in a rectangular Pyrex dish. Happy 4th of July, Italian style! Sharing this festive dessert with the talented bloggers at Fiesta Friday hosted by Angie@Fiesta Friday, Josette@The Brook Cook and Julie@Hostess at Heart. 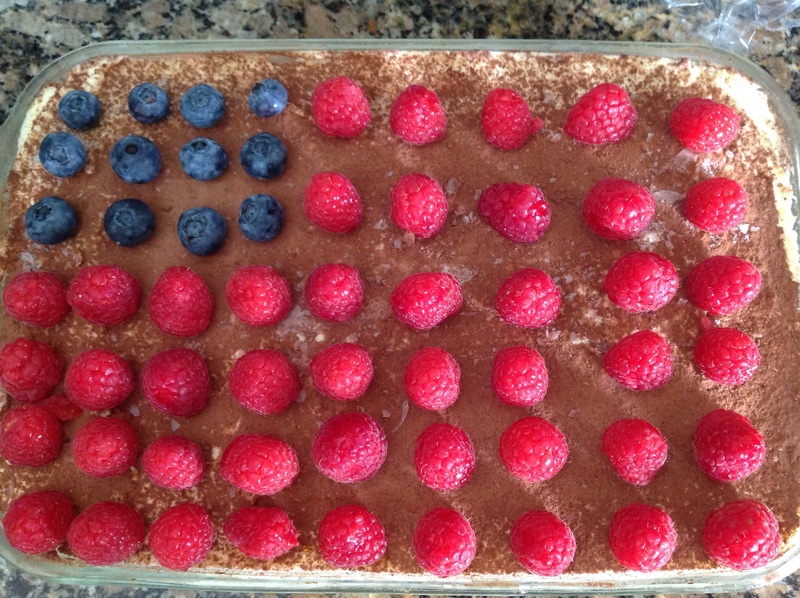 This entry was posted in Recipes and tagged 4th of July tiramisu, Authentic Italian tiramisu, ice box dessert, no bake dessert, Patriotic tiramisu, Tiramisu with berries by Johanne Lamarche. Bookmark the permalink. Johanne, this is such a beautiful dessert! I wish that I could just try a little piece right now! Wish I could serve you a slice! Simply decadent! Me too, Quinn! We have similar tastes I think. This is the real deal, straight from Roma. Happy 4 th! What a work of art Johnanne! Love Tiramisu and your recipe is the real thing, wow! Love your added touch to it, Happy 4th, and Happy Canada Day for yesterday :). Thank you Loretta! And Happy 4th to you as well! Johanne this is terrific looking! I really like the idea of tiramisu but am mostly disappointed when I order it in restaurants. Your recipe in this post seems better and more Italian and special and what I would like. I am a fan of not-too-sweet desserts and can just imagine how good this would be for a 4th of July gathering. As always you amaze me.. happy 4th! Thank you so much Teresa! You are so kind. This is an authentic tiramisu recipe and I hope you will give it a try. When uncooked liqueur is used I find sometimes it is too overpowering or not well distributed. Lynne omits it altogether in her tiramisu and it is not missed. Happy 4th to you! Looks like rain here. Thank you Naina! Enjoy your weekend as well! Thank you Josette! Happy 4 th to you as well. LOVE your S’Mores bars. They look irresistible! Thanks for hosting us on this holiday weekend! Thank you so much! SO good!! 🙂 Have a great weekend!